The Pierce County Skill Centre (PCSC) in Puyallup, Washington has installed a ProtoMAX into their Aerospace Manufacturing and Fabrication program to facilitate accurate material cutting while showcasing design and advanced fabrication techniques. PCSC is a vocational training centre teaching high school juniors and seniors during the regular school year and 9th thru 12th grades during a three week introductory summer program in a wide range of hands-on professional experiences. Starting in 2010, the skill centre has been a hallmark of Pierce County serving the surround school districts. From fire science to pre-veterinary, students practice trades that will give them a glimpse into a career path. One of the prominent programs offered at PCSC is Aerospace Manufacturing and Fabricating. Being in close proximity to Boeing and McChord Air Force Base, the students of the South Puget Sound see the aerospace industry in their backyard nearly every day. Seattle isn’t nicknamed Jet City for nothing. Needless to say, aerospace is a highly technical vocation (it is rocket science) and it’s not always understood what it means as a career path. The program is a way to help students explore and experience what really goes into aerospace production. “We use the ProtoMAX to cut parts that we can’t make by hand or with our other machines,” said Trapp. “We have a CNC plasma cutter, but it lacks the detail and accuracy. We also have a CO2 laser engraver but it can’t cut metals. 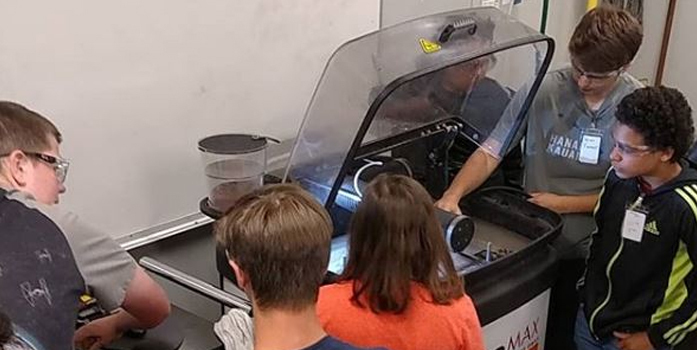 The ProtoMAX fills the void for being able to cut small parts with high precision on any material.” Students use the waterjet to cut parts out of aluminium, steel, titanium and carbon fibre usually around 1/4th inch thick. Occasionally they have cut thicker materials for personal projects.